Zach’s been fascinated lately by a book called Eating on the Wild Side (New York: Little Brown and Company, 2013). In it, Vashon Island resident Jo Robinson explains how humankind has been destroying the nutritional value of fruits and vegetables since the inception of farming. “Starting with the very first gardens, our farming ancestors chose to cultivate the wild plants that were the most pleasurable to eat. As a rule, the chosen plants were tender, low in bitterness and astringency, and high in sugar, starch, or oil. Plants that were bitter, tough, thick-skinned, dry, devoid of sugar, or too seedy were left behind in the wilderness. Why go to the trouble of cultivating plants that are unpleasant to eat? The good news is that she also introduces scientifically proven methods and recipes for storing and preparing produce to maximize both flavor and nutrition. 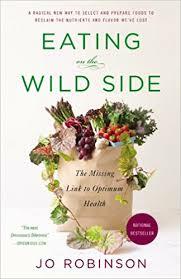 This award-winning book might very well change your food habits, from how you store your lettuce to deciding which foods in your fridge you should eat for dinner tonight.